Very few people who watched the Sadio Mane high-foot live thought it was a red-card offence at first. There was intially enormous shock that he was sent off for challenging for the ball – when Manchester City’s keeper Ederson had sprinted 40-yards out of his goal and gone for it with his head. 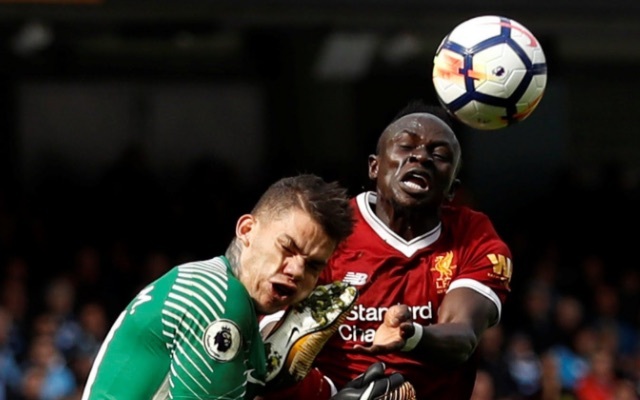 On second viewing though, there’s definitely an argument that it was a red, but John Moss sent Mane off because of how badly the keeper was injured – rather than the actual offence. Claudio Bravo replaced the Brazilian and has blamed our Senegalese flyer entirely. “These things are avoidable. You can easily avoid putting your foot in somebody’s face so you don’t do them damage,” Bravo told Sky Sports. “At first I thought that he had hit him in the hip, but then I saw clearly that he got him with the face. “You go from being on the bench watching the game and within seconds you’re out there playing. Us goalkeepers know this can happen, but you never expect it. Bravo is actually equally responsible, for sprinting out for the ball in such a reckless nature. If Mane hadn’t gone with his foot, there’d have still been a horrible clash – possibly of heads. Regardless, we hope he’s back up and running soon. It was an accidental collision and not something that should be held against either player.